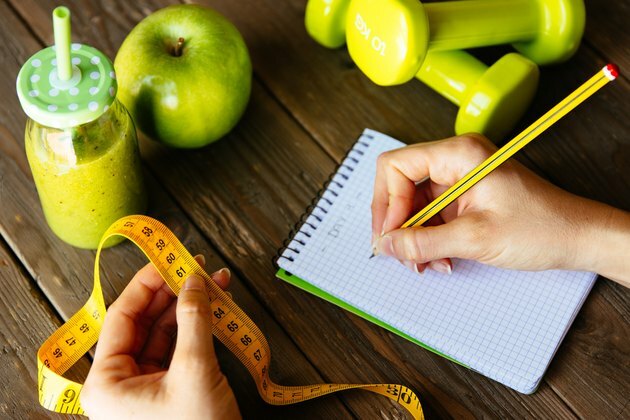 You need to set your sights on a goal before you start a new weight-loss plan. The goal you should focus on is your ideal weight, and it is crucially important to know that number. This is because the excess pounds of body fat you carry could increase your risk of obesity, heart disease and even certain cancers, according to the National Institutes of Health. Once you have identified the amount of pounds you need to lose, you can then focus on accomplishing your weight-loss goals. Measure your weight and height. Weigh yourself in the morning before your first meal of the day, whether breakfast or brunch. This is the time of day when your stomach isn't full and you'll get a more accurate weight measure. Jot down these two figures on a piece of paper. Calculate your ideal body weight. For women, start with 100 pounds and add 5 pounds to every inch over 5 feet in height. A woman with a height of 5 feet, 6 inches should weigh about 130 pounds, as 6 multiplied by 5 equals 130. For men, start with 100 pounds and add 6 pounds to every inch over 5 feet tall. A man who is 6 feet -- or 12 inches over 5 feet in height -- should weigh 172 pounds. Take your current weight and subtract it from your ideal weight. This will give you the number of pounds you need to lose. For instance, a woman who is 5 feet, 6 inches and weighs 165 pounds should lose about 35 pounds. A man who is 6 feet tall and weighs 225 pounds should lose 53 pounds. Make an appointment with your doctor for a more accurate estimate, especially if you are a child under the age of 18. A pediatrician uses a growth chart for estimating how much your child should weigh. Additionally, men and women who are less than 5 feet tall or missing limbs will not be able to use any at-home method for estimating an ideal weight or calculate how much weight they need to lose. If you are a bodybuilder, athlete or work out regularly, you may weigh more than the average person and be considered overweight according to the standard weight/height calculations. Consult your doctor to calculate your actual body fat and determine if you need to lose weight. Always talk to your doctor before starting a new weight-loss plan, especially if you are under the care of a physician for a medical condition. National Institutes of Health: Do You Know the Health Risks of Being Overweight?